The settlement of Charlesbourg-Royal survived just two years and was abandoned twice. The first European colony in Canada (after the Vikings in 1000 AD) was the French colony of Charlesbourg-Royal in modern-day Quebec, Canada. Built in 1544 it would be preceded by only one other European colony on the East Coast of North America: San Miguel de Gualdape built in 1526 in Georgia. Thus Charlesbourg-Royal is the second European colony on the East Coast but the first in Canada. Although typically the story of European colonization ends badly for the local natives, this time the native Hurons successfully drove not one but two groups of French colonizers out of their lands and back to Europe. If any of the colonists kept journals it’s certain to provide many interesting details about Native Americans at the time of European contact. Cap-Rouge (English: Red Cape) is located in central Quebec, Canada on the Saint Lawrence River within the Borough Sainte-Foy–Sillery–Cap-Rouge in Quebec City. The site of the first attempted permanent European settlement in North America, Cap-Rouge was long a town on its own before being incorporated within Québec on January 1, 2002. In 1541 Jacques Cartier established a settlement of 400 people at present-day Cap-Rouge. 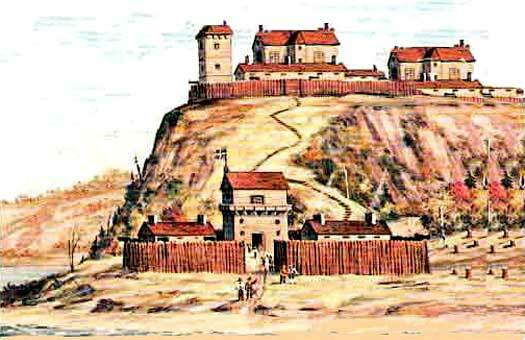 Named Charlesbourg-Royal, the encampment survived its first winter but was abandoned in June 1542 due to harsh weather and attacks from neighbouring Iroquoians of Stadacona and other villages. In August 2006, Quebec Premier Jean Charest and Canadian archaeologists under Yves Chretien announced the discovery of this long-lost settlement. Chretien identified its location from fragments of a decorated c.1540-1550 Italian style ceramic plate and six wood timber samples dated to the mid-16th century by a United States laboratory. Re-occupied during the French colonisation effort of the 17th century, the area remained agricultural until the 1960s when residential developments transformed it into a suburb of Québec City.